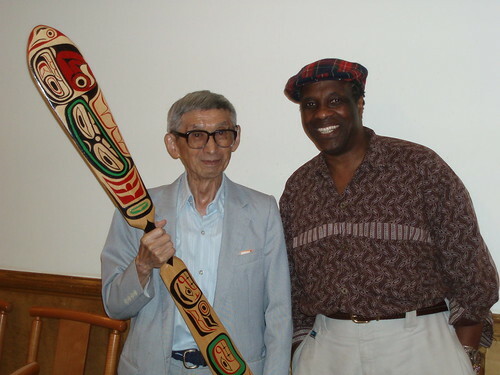 Harry Aoki and his good friend Themba Tana – after the Musical Tribute for Harry at the Firehall Arts Centre. Harry and I had so much fun at Gung Haggis Fat Choy dinners in both Vancouver and Seattle. He was a staunch supporter of the “Save Kogawa House Campaign” and performed with us at the house many times. He played his harmonica as a “gift” for Joy, when she gave the speech at the Canadian Club of Vancouver’s “Order of Canada” luncheon…. And last year, to see Harry on stage at UBC, representing his brother, for the degrees to the Japanese-Canadian former UBC Students who could not finish their degrees because of the internment. It was an honour to play at Harry’s Tribute at the Firehall Arts Centre a few years ago…. and to play at his monthly First Friday events. I first met Harry Aoki through Asian Heritage Month events around 2002. Margaret Gallagher (CBC Radio) raved about Harry, as he sometimes performed with her. It was a real treat to have Harry perform at the 2006 Canadian Club Vancouver “Order of Canada” luncheon where Dal Richards introduced himself to Harry, then invited Harry to be interviewed on his radio show. Harry had played his harmonica, and talked about the internment and his journey. In 2006, the first open house event at Historical Joy Kogawa House in 2006, captured on film for the CBC documentary Generations: The Chan Legacy. Harry and I would meet sometimes at Oakridge Mall. I was working at the library, and he lived nearby at the time. Sometimes he would just drop in and ask for me. Sometimes I would phone him and arrange to meet him at my lunch or dinner time. These chats were always a pleasure. Harry would really have enjoyed the chance to perform with Jocelyn… she was one of the inspirations at our 2011 Gung “Hapa” Fat Choy Dinner that inspired the creation of Hapa-Palooza Festival. Here are some emails from friends about Harry, that they have shared with me, and thought we would share with readers. I have so many fond memories of Harry…meeting him at the Nikkei Centre for the first time, his 80th birthday party musical jam in the Marr garage, so many First Forum Fridays, the tribute to him at the Firehall and later at UBC, him lugging that bass EVERYWHERE! Sometimes in our busy lives we always invariably do not give enough attention to those we love, always thinking they would somehow live forever or we will always me up or bump into each other at some late stage. I have seen many such people I admired come and gone – often regretting not having that one more moment to share together. The key to one’s life is memory – as long as Harry stays in our memory and we keep talking about him and listening to his music, he lives. Here are some links to articles about Harry – many on the JCCA Bulletin – but I am pleased that a lot of my pictures of Harry come up. Vancouver Observer news editor attended the 2013 Gung Haggis Fat Choy Dinner and wrote the following story. Mayor Gregor Robertson speaks to the audience on stage, with Gung Haggis organizers Todd Wong and Constance Barnes. Photos by Jenny Uechi. At the annual Gung Haggis Fat Choy, Floata Restaurant in Chinatown became a sea of Scottish kilts and shimmering Cheongsam dresses. The event, now a famed tradition (celebrated also in Seattle, after having originated in Vancouver), blends Chinese New Year with the Scottish Robbie Burns Day. The tradition began in 1993 when Todd Wong, a fifth-generation Chinese Canadian, was asked to help with the Robbie Burns celebration at Simon Fraser University. The event, which turns out a large and enthusiastic crowd each year, brought together guests for a lively evening of music, food, poetry and dancing. Gung HAGGIS Fat Choy tickets now…. as of end of Saturday, January 26th. Next year’s dinner will be January 26th 2014 – Don’t Miss Out! Sir James Douglas is coming to Gung Haggis Fat Choy Robbie Burns Chinese New Year Dinner tonight… at Floata Restaurant in Chinatown. We are very pleased because the first Governor of British Columbia visioned the Colony of British Columbia as a place where people from all around the world could come to live in peaceful harmony. Here is Sir James Douglas, with his wife, the Lady Amelia, at the 150th Anniversary of the founding of the Colony of British Columbia, now called Douglas Day in his honour. 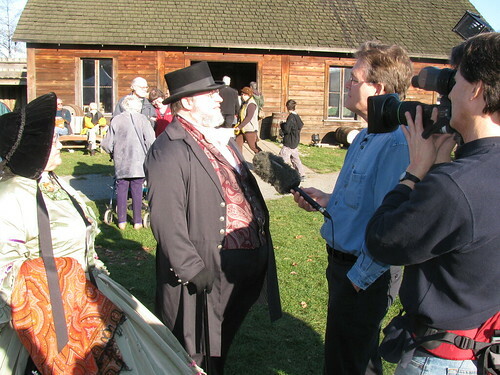 This picture is from Nov 28, 2008 at Historic Ft. Langley. Douglas was born in the Caribbean country of British Guyana. His father was Scottish and his mother was Creole, a Free Black from Barbados. He was educated in Lanark, Scotland, before arriving in Canada to work with the North West Company, and later for the Hudson’s Bay Company becoming a high-ranking company officer. From 1851 to 1864, he was Governor of the Colony of Vancouver Island. In 1858 he also became the first Governor of the Colony of British Columbia, in order to assert British authority during the Fraser Canyon Gold Rush, which had the potential to turn the B.C. Mainland into an American state. He remained governor of both Vancouver Island and British Columbia until his retirement in 1864. He is often credited as “The Father of British Columbia”. 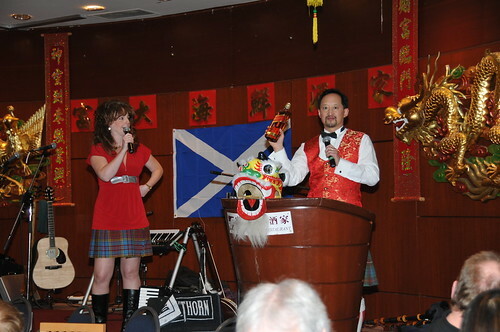 Here is a picture from the 2009 Gung Haggis Fat Choy dinner – with Sir James Douglas on the far right in Black & White. All the life-size pictures are from Royal BC Museum exhibit “The Party” which envisioned inviting 150 of BC’s builders of culture and society. So in the background the pictures are Emily Carr, Todd Wong, Lt. Richardson (bagpipes), John Foster McCreight (first premier), Chief from Songhees nation, Emery Barnes + Sir James Douglas. The live people in front are elected officials at the time reading verses of a Robert Burns Poem, then Parks Commisioners Stuart Mackinnon, then Councilor Ellen Woodsworth, present city councilor Kerry Jang, former councilor Suzanne Anton, and current Commisioners Sara Blyth and Constance Barnes (also daughter of Emery Barnes). 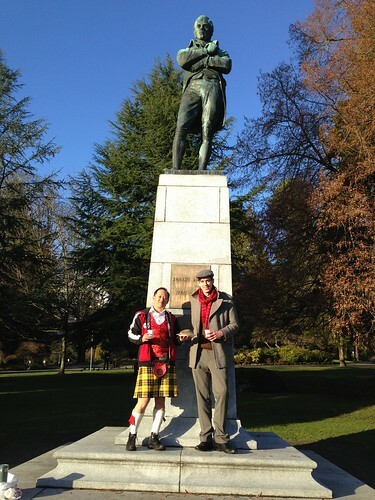 Here is Lewis Kane with me at the Burns Statue in Vancouver’s Stanley Park. We had earlier been at the Burns Poetry Marathon at Simon Fraser University Harbour Centre where Lewis had played my Accordion for Auld Lang Syne, and I had performed a “rap” version of Burns’ Address to the Haggis. Then I told Lewis about the Burns statue in Stanley Park – which he didn’t know about… So off we went to Stanley Park, after a quick stop to the Liquor Store and the food court where we found styrofoam glasses and a paper plate. “This statue of Robert Burns, Scotland’s National Bard, was unveiled by J. Ramsay MacDonald, a Prime Minister of Britain, on 25th August, 1928. Robert Burns’s sincere desire for friendship and brotherhood among all peoples is clearly shown in his many poems and songs. His poetry and letters, both serious and humorous are worthy of study by those who value liberty and freedom. This memorial was rededicated on the 200th Anniversary of the Bard’s death by the Burns Club of Vancouver 21 July 1996. At the statue we met a man and a woman who were sitting in the sunshine, at the base of the statue. We struck up a good friendly conversation by asking how they came to the Burns statue today, and where were they from? Peter was from Tasmania, and Laura had just picked him up from the Vancouver airport, and on Sunday they would drive to Seattle where she lives. Peter was amazed at the coincidence of our meeting. He has Scottish ancestry, and he was very surprised to 1) find a Burns statue in Vancouver, 2) to meet somebody from Scotland (Lewis) 3) that two people (us) would bring a haggis and a bottle of scotch to the Burns statue and 4) that we would invite him to the Gung Haggis Fat Choy Dinner in Vancouver on January 27th, and in Seattle on February 17. 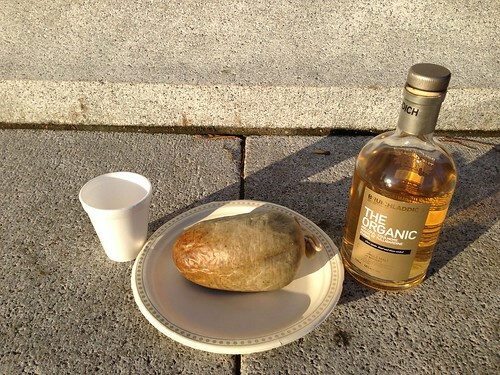 We took pictures for each other, then left the haggis and a cup with a bit of whisky in it, as an offering for Rabbie. Years ago, somebody used to leave a glass cup with whisky in it for Rabbie, along with a rose… but I haven’t seen it done now for a couple of years. Dress Code: Ethnic Fun and flair is the best description. You can wear a traditional dress kilt, or a Chinese cheong sam dress. Or a combination! You can wear something from your ancestral culture or somebody else’s or a combination. This is a fun event. Some people like to dress up, some people come casual. Arrive Early: The doors will open at 5:00 pm.There is FREE Parking in the Chinatown Parkade on Keefer St @ Columbia St. Just tell the attendant you are coming to the Gung Haggis Fat Choy dinner, and get a parking pass from them. Floata Restaurant is on the 4th floor of the parkade. If you are walking from a bus or skytrain station you can enter through the doors of the Chinatown Plaza and walk up 2 flights of stairs are take the elevator. We have some great raffle prizes lined up. Lots of books (being the writers we be), gift certificates and theatre tickets + other surprises. One of the feature prizes is the two-ticket package to Vancouver Opera’s Magic Flute – value $350. It is amazing as it is designed with a First Nations theme and context. Here is my 2007 Review. There are also tickets from Arts Club 4 hands 2 Pianos, The Cultch’s “Extraction”, Fateway’s “Sisters” by Simon Johnston and VACT’s Asian Comedy Night. And there are some great books. Harbour Publishing has just donated The Chuck Davis history of Metropolitan Vancouver. Arsenal Pulp Press is donating copies of David Wong’s historical graphic novel “Escape to Gold Mountain”. Evelyn Lau is donating her new poetry collection “A Grain of Rice”. And there are lots more prizes. Please buy raffle tickets… this is how we generate our fundraising. We purposely keep our admission costs low to $65 for advance regular seats so that they are affordable and the dinner can be attended by more people. Children’s tickets are subsidized so that we can include them in the audience and be an inclusive family for the evening. the Asian Canadian Writers’ Workshop, publishers of RicePaper Magazine, the Gung Haggis Fat Choy Dragon Boat Team and the Historic Joy Kogawa House Society. Please support our missions of supporting and developing emerging writers, organizing reading events, and to spread multiculturalism through dragon boat racing – or come join our teams! The first appetizer dish will appear once people are seated, and before the Piping in of the musicians and head table. We will lead a singalong of Scotland the Brave and give good welcome to our guests, only then will the next appetizers appear. You want to eat, you have to sing for your supper! quickly followed by one of our co-hosts introducing a poet or musical performer. Serving 30 tables within 5 minutes, might not work completely, so please be patient. We will encourage our guests and especially the waiters to be quiet while the performers on stage. Then for the 5 minute intermissions, everybody can talk and make noise before they have to be quiet for the performers again. Expect the unexpected: I don’t want to give anything away right now as I prefer the evening to unfold with a sense of surprise and wonderment. But let it do be known that we have an incredible array of talent for the evening. We do incorporate some if not many elements of a traditional Burns Supper, and try to integrate many elements of a Chinese New Year Dinner. But basically it’s the same in both cultures: eat, socialize, drink, sing songs, have fun. Our non-traditional reading of the “Address to the Haggis” is always a crowd pleaser. In the past we have selected members of the audience to join us on stage to read a verse. Past participants that have included former federal Multicultural Minister Raymond Chow, Qayqayt (New Westminster) First Nations Chief Rhonda Larrabee, a descendent of Robert the Bruce, a doctor from White Horse, and even somebody doing a vocal impression of Sean Connery. Who will it be for 2013? We leave it up until the evening to decide. Haggis Etiquette : It’s probably polite not to say disgusting things about it, and that is why we also serve Chinese spicy jelly fish to encourage Scottish people to eat something strange that is a Chinese delicacy. Not every course has haggis in it. Only the haggis & shrimp won tons and the haggis shu-mei pork dumplings. For the non-haggis eaters, you can eat the vegetarian turnip cake, and the BBQ pork. 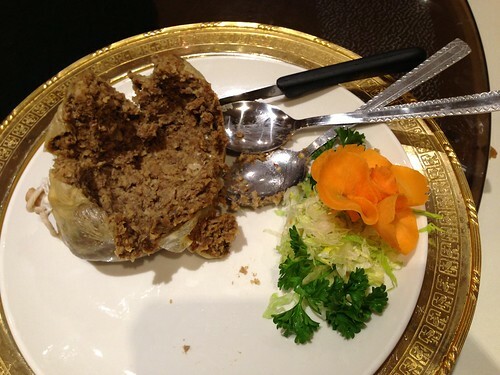 Traditional haggis is served for the purists – but at the same time as a vegetarian Chinese lettuce wrap. This way the vegetarians get another dish, and the meat eaters can put a spoonful of haggis into their lettuce wrap. If you have a table of mostly non-haggis eaters, please offer to share your haggis with a table of Scottish haggis-eaters. This is a great way to make friends with the tables around you, and maybe make a trade for something else. We will close off tickets sales on Saturday. My partner Deb likes men in kilts – At the 2008 Gung Haggis Fat Choy dinner, she poses with Vancouver City Councilor Raymond Louie, and then-MLA, but soon-to-be Mayor Gregor Robertson. Vancouver Mayor Gregor Robertson has confirmed his attendance for the 2013 Gung Haggis Fat Choy Robbie Burns Chinese New Year Dinner… Gregor wasn’t able to attend in 2010 or 2012 – but will be reading Burns poetry and wearing his kilt in 2013. He first attended the Gung Haggis dinner in 2008 wearing his Robertson family tartan… then captured the cameras attention at the 2008 mayoral inauguration when he wore his kilt. But… we saw it first at Gung Haggis Fat Choy! Here’s a video from the 2009 Gung Haggis Dinner that features Robertson cutting the Haggis. Also in the video is hip hop artist Ndidi Cascade who will also be performing at the Gung Haggis dinner event. It’s been great watching Ndidi perform around town such as at the Vancouver 125 Anniversary celebrations at Jack Poole Plaza in 2011. This weekend she will be performing with celtic/hip hop fiddler Kytami at the Red Room. City of Vancouver Poet Laureate Evelyn Lau will be attending the Gung Haggis dinner, and is donating copies of her new poetry book “A Grain of Rice” for our raffle prize. Last year, Lau’s 2010 poetry collection “Living Under Plastic” won the Pat Lowther Award. More additions to the raffle prizes are coming in. We have some great tickets from the Arts Club Theatre for tickets to the production 2 Pianos 4 Hands at the Stanley Theatre. 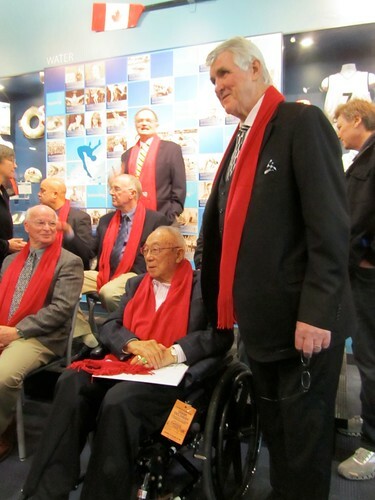 Hockey Legend Larry Kwong will be inducted into the BC Sports Hall of Fame in 2013. I attended the announcment of the 2013 inductees with my friend Chad Soon, who had nominated Mr. Kwong for the honour. It was a fun morning as the names were called by famed announcer Tom Larscheid, himself an inductee. The first name called was swimmer Brent Hayden, who recently won a bronze medal at the London 2012 Olympic Games. At three-time Olympian, Hayden was 2007 world champion in the 100-metre freestyle. back row Brent Hayden – swimming, Robert Hindson – rugby, Pat Quin – W.A.C. 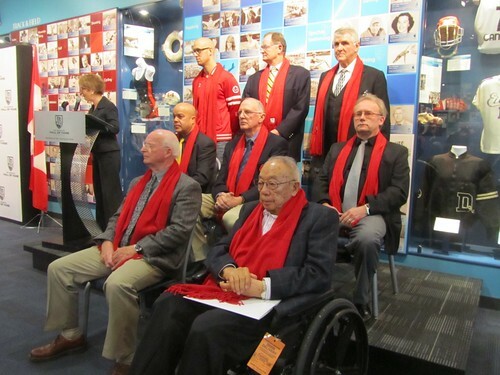 Bennett Lifetime Achievement; Middle row: Keven Alexander – lacrosse, Ken Shields BUILDER basketball, Larry Isaac MEDIA; front row Ralph Hutton – TEAM swimming (1965 Ocean Falls Swim Clubs); Larry Kwong PIONEER – hockey. Hockey Legends – Pat Quin recieved induction for lifetime achievement W.A.C. Bennett Award and Larry Kwong is named as Pioneer. Kwong was actually the first non-white hockey player in the NHL in 1948, only a year after Jackie Robinson broke the colour barrier in Major League Baseball. Kwong preceded Fred Sasakamoose (aboriginal) in 1953, and Willie O’Ree (African) in 1958. But Kwong was also an outstanding player. He was a star forward in 1939 with the Vernon Hydrophones, helping to lead them to the midget hockey championship of BC in 1939 and then to the provincial juvenile title in 1941. Kwong then joined the Trail Smoke Eaters which had recently won the 1939 World Ice Hockey Championships. With the outbreak of World War II, Kwong enlisted in the Canadian Forces. Instead of being deployed overseas like many others, he was recruited to play hockey to entertain the troops. In 1945, he returned to play with the Trail Smoke Eaters, which won the West Kootenay Hockey League Championship. In 1948, his second year with the New York Ranger’s farm team, Kwong was the Rovers’ top scorer with 57 points (20 goals and 37 assists). Despite his performance, other players were promoted to the Rangers before him. When he finally got called up to play for the Rangers against the Montreal Canadiens on March 31,1948 – he only played one shift in the third period. Disappointed with the Rangers, Kwong took a more lucrative contract with the Valleyfield Braves in the Quebec Senior Hockey League (QSHL) from 1948 to 1955 racking up 445 points (198 goals and 247 assists). Coached by Toe Blake, Kwong was named as an assistant captain of the Valleyfield Braves. In 1951, Kwong won the Vimy Trophy as the Most Valuable Player of the QSHL. That year, he led the Valleyfield Braves to the league championship and then to the Alexander Cup, the Canadian major senior title. In the following QSHL season (1951–52), Kwong’s 38 goals were topped only by Jean Béliveau’s 45 tallies. In his nine-year tenure in the Quebec League, competing against future NHL All-Stars such as Béliveau, Jacques Plante, Dickie Moore, Gerry McNeil and Jean-Guy Talbot, Kwong averaged better than a point per game. Kwong also spent one season with the Nottingham Panthers in Britain, scoring 55 goals in 55 games, before moving to Switzerland where he led HC Ambrì-Piotta in scoring as player-coach. He later coached HC Lugano and HC Lausanne. Kwong also became a tennis coach in Switzerland. Here are photos from last night’s taste-test and rehearsal dinner at Floata Chinese Restaurant. Half the dishes are vegetarian including: turnip cake appetizer, winter melon soup, lettuce wrap, buddha’s feast + efu long life noodles. Meat dishes are steamed salmon, szechwan chicken, bbq pork, + traditional haggis. 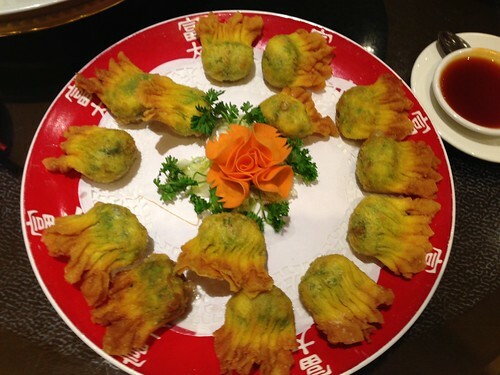 Our specialty appetizer items are deep-fried haggis & shrimp won ton, and haggis & pork su-mei dumplings. 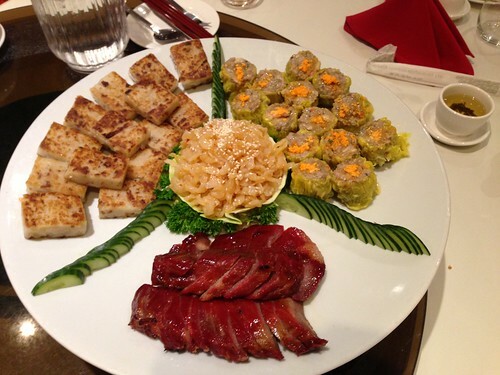 This is the appetizer platter: Spicy jellyfish (center), BBQ pork (front), Lo-Bak-Goh turnip cake (left), and haggis & pork shu-mei dumplings. Delicious! Our famous Haggis & shrimp Wonton dumplings – Shanghai style! Utterly tasty…. It is one of our mentor Jim Wong-Chu’s favorite items on the menu that he looks forward to tasting each year. But this year, we had a neophyte from Scotland – Lewis Kane. We asked Lewis to try one… to see if a real Scottish person would eat it. And… he liked it…. he said it was real good… and that they should do this in Scotland. 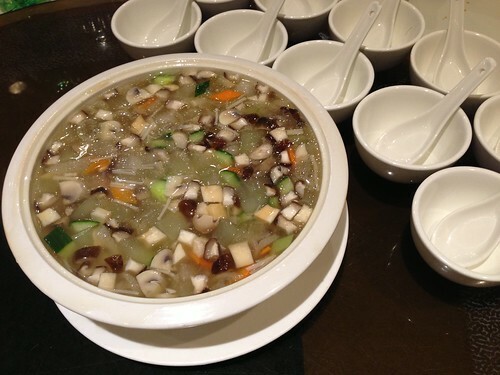 Winter Melon soup… would be a staple if winter melons grew in Scotland. Sublime in flavour, delicately balanced with mushrooms, cucumbers, carrots and lots of other good things. Here is the trusty haggis… expertly sliced open with a St. Andrew’s cross… spoonfuls of haggis were added to the Chinese vegetarian lettuce wrap. Very tasty – just like a hamburger without the bun. Remember to put lots of Chinese Hoi-sin bbq sauce inside. 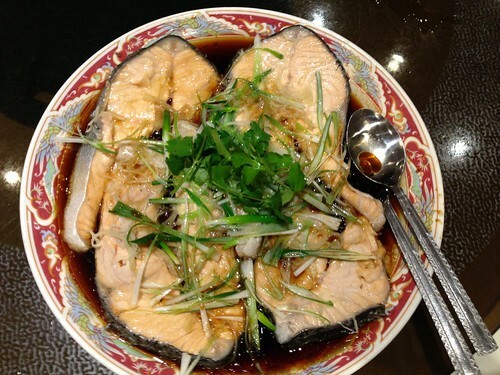 Steamed salmon – flavoured with hot oil and ginger, and topped with chives and cilantro. This was one of the original dishes that I had personally prepared at the original Gung Haggis Fat Choy Dinner backin 1998. So mouth-watering good… it melts in your mouth. The other dishes were so tasty – we ate them up before we could take a picture. This included the Szechwan Chicken… the Buddhist’s feast… the e-fu long life noodles, and the mango pudding. Auchentoshan scotch whisky: The Three Wood is one of my favorites. But is also comes in Classic and 12 year too. Vancouver Opera: two tickets to an upcoming performance – it might be their upcoming First Nations version of Mozart’s Magic Flute March 9-17th or it could be the premiere of Tan Dun’s Tea: A Mirror of Soul May 4-11th. The Cultch aka Vancouver East Cultural Centre – play Winner of the Rio Tinto Alcan Performing Arts Award, Theatre 2013. Extraction is a documentary theatre show that delves deep into the heart of intertwined cultural phenomena: China’s rise as an economic power and oil extraction in Alberta. Mining the biographies of non-actor performers, this bilingual (English and Mandarin) play digs beneath the surface of highly charged political debates to illuminate lives transformed by legendary traffic jams, boomtown fever, translation trouble and diplomatic intrigue in Beijing and in Fort McMurray’s tar sands, which has been called one of the largest industrial projects in human history. Escape to Gold Mountain – the hot new graphic novel written and drawn by David Wong. This is the first graphic novel to tell their story: based on historical documents and interviews with elders, this is a vivid history of the Chinese in their search for “Gold Mountain” (the Chinese colloquialism for North America) as seen through the eyes of the Wong family. They traverse the challenges of eking out an existence in their adopted homeland with hope and determination, creating a poignant immigrant’s legacy for their sons and daughters. FYI: David Wong is the creator of the Gung Haggis Fat Choy dragon boat team logo, and he paddled on the team for its’ inaugural year in 2002. Talon Books – Tracing the Lines: Reflections on Contemporary Poetics and Cultural Politics in Honour of Roy Miki, edited by Larissa Lai, Christine Kim, Christopher Lee, and Maia Joseph. Floata Restaurant always gives us a gift certificate for food! + more on the way…. maybe the Gung Haggis Fat Choy dragon boat team can take you and 9 friends out on a dragon boat for a tour of False Creek…. and…. Jim Wong-Chu is donating a PSY Gangnam-Style bobble head to contribute to the prizes.